Sorry, no longer available. Robotalk2 is now available starting in 2009! The Robotalk is based on the famous Oberheim Voltage controlled filter which was also sold as the Maestro filter sample and hold. It is a cool envelope follower with a second mode. This mode is "sample and hold" and sounds like a synthesizer's sample and hold, similar in sound to the Z.Vex ooh wah. 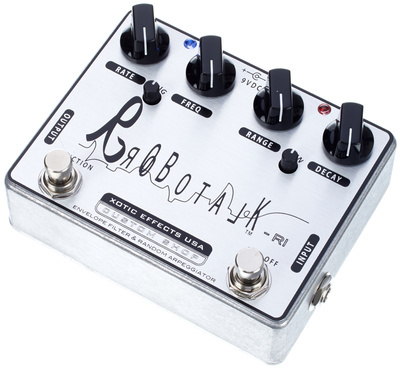 The Robotalk is actually THREE effects in one as it has an added LO-PASS filter mode which allows controlling the frequency range with an expression pedal! This makes it into a cool filtery-sounding wah. List price is $280, we are selling them for $252. Power jacks (it uses two 9VDC jacks, they must be seperate supplies or 2 outputs from PP2) are a $30 option.